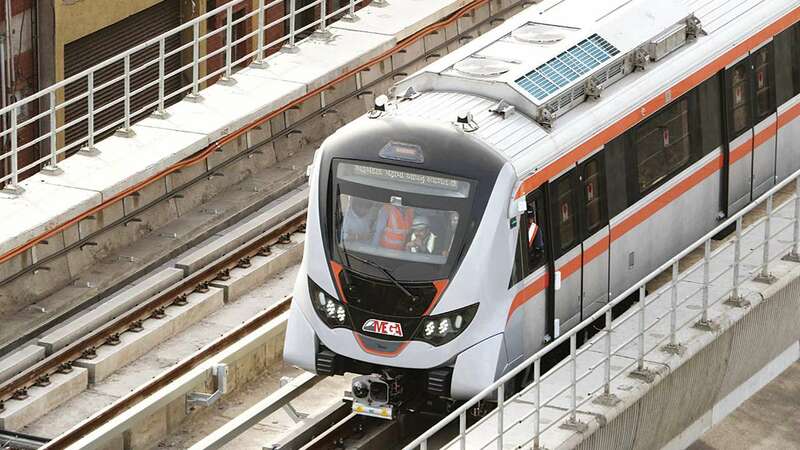 The Gujarat Metro Rail Corporation (GMRC) will launch the new Ahmedabad Metro Rail (MEGA) project successfully on March 2019 known popularly as Phase 1 initiative. You can check the latest timetable and timings of Ahmedabad Metro Rail running between North-South and East-West corridor. Citizens can also start booking tickets online for their convenience of travel between different routes of Ahmedabad Metro project. The ticket prices has been kept in minimal margin range and the highest ticket price will be around Rs.40 from end to end travel in any corridor or route. The trail run has been completed successfully between Apparel Park and Vastral Gam Metro station. Currently the metro line is ready between Apparel Park in Khokhra area of old Ahmedabad to the industrial zone of Vastram Gam to help the commute for office workers residing in those areas. However we have provided the detailed route map analysis with ticket fare system that will be applied for the newly launched Ahmedabad Metro. Both these corridors cover numerous stations on the way and there will be a changing point for both corridors for people to board on a different route. The East-West corridor of Thaltej and Vastram Gam is likely to fetch the highest order of traffic due to it's inclusion of Kalupur Railway Station and Gujarat University. The APMC Market - Motera Stadium --- Metro availability at an interval of 30 minutes to start with and after the rolling stock is available, GMRC will increase the frequency. The Thaltej Gam - Vastram Gam --- Metro availability at an interval of 20 minutes to start with since the public will be higher on this diverse route. For both the ends, the start of Metro will be from 06:00 AM in the morning and the last metro will run at 23:00 PM at night. The Government of Gujarat is planning to make the travel free for all the citizens and public of Ahmedabad for initial two months of time. The same approach when BRTS was first launched and it became an instant hit among the people. SMART Card system to be brought in for QR Code scanner system and ticket booking online facility to be in place after 2 months of time.